I've always had a fascination with Hawaii, probably because as a child I spent many hours watching Hawaii 5-0 with my grandmother. And while traveling to Hawaii still remains one of those bucket list items, I was excited to find out that a new Hawaiian restaurant called Uncle's Hawaiian Grindz had opened in Fallston. Oahu native Kaiman Chee, grand prize winner on Food Network's Cutthroat Kitchen, is the chef/owner of this casual dining restaurant. Along with his partner, Fallston native Kosmas “Tommie” Koukoulis, Chef Chee is bringing the flavors of Hawaii to Maryland while sourcing his ingredients locally. Recently, The Minx and I decked ourselves out in Hawaiian shirts and visited the restaurant to see what Hawaiian cuisine was all about. Since poke (pronounced poe-kay) is becoming a trend in this part of the country, we started off with the poke boat, featuring four different styles of poke. Both the Queen Street Tuna and Walu Poke had bright, fresh flavors thanks to elements like lime, ginger, and avocado. The Minx does not like raw salmon, but she enjoyed the salt-cured Lomi Salmon, which was enhanced by the addition of tomato, scallion, onion, and "firecracker" aioli. The biggest surprise, however, was the deep fried tofu poke which uses tofu sourced from the Eastern Shore. The tofu is tossed in red pepper flakes and citrus shoyu before being battered and deep fried. Anyone who says they don't like tofu will be converted by this dish. Since WWII, Spam has been beloved in Hawaii, and a sushi-like dish called musubi is a staple on the Islands. Uncle's Spam Musubi is teriyaki-marinated Spam wrapped in rice and nori, served atop a combination of kabayaki glaze and Uncle's secret sauce. Although I ate Spam regularly as a kid, I could not stand the saltiness as an adult. However, this Spam was surprisingly mild and the overall texture of the musubi was quite pleasant. One of that evening's specials was a pineapple corn fritter, which was both unusual and delicious. The pineapple flavor was subtle, and somehow lent a bit of lightness to the fried dough ball. Kalua pig is a Hawaiian preparation in which a whole pig is wrapped in ti or banana leaves and buried in the ground where it is slow cooked. To simulate this preparation, the restaurant invested in a special $17,000 oven that somewhat approximates the conditions of a traditional underground oven, or imu, producing moist, succulent pork. The Kalua Pig Lumpia appetizer mixes the smoke-braised pork with carrot and cabbage and stuffs it inside a spring roll wrapper before frying. The delicate, crunchy wrapper is the perfect vehicle for the sweet pork and veggie mix. There's additional sweet sauce on the side if you like it extra sweet, but we didn't find it necessary. For our entrees, we thought we should try one of the mixed plates so that we could experience several menu items at once, and also select one of the sandwich offerings. We went with the Uncle's Mixed Plate which had Huli Huli Chicken, Shrimp Shack Skewer, and Beef Teriyaki, along with an Asian stir fry of mixed vegetables. We also added the Kalua Pork to the plate so we could try the meat on its own. Unlike the full entree version of the Huli Huli Chicken, which is a full half chicken, the sample on our plate was a shredded pile of flavorfully brined meat. The pork and beef were also boldly seasoned, and the grilled shrimp had that wonderful briny flavor that we love so much. It was a delight to sample each type of protein in a rotation and get a different bite with every forkful. Macaroni salad is a big thing in Hawaii, so it is served family style, along with white rice, for the entrees. The macaroni salad was creamy and mild, and surprisingly not as sweet as typical picnic-style mac salad. 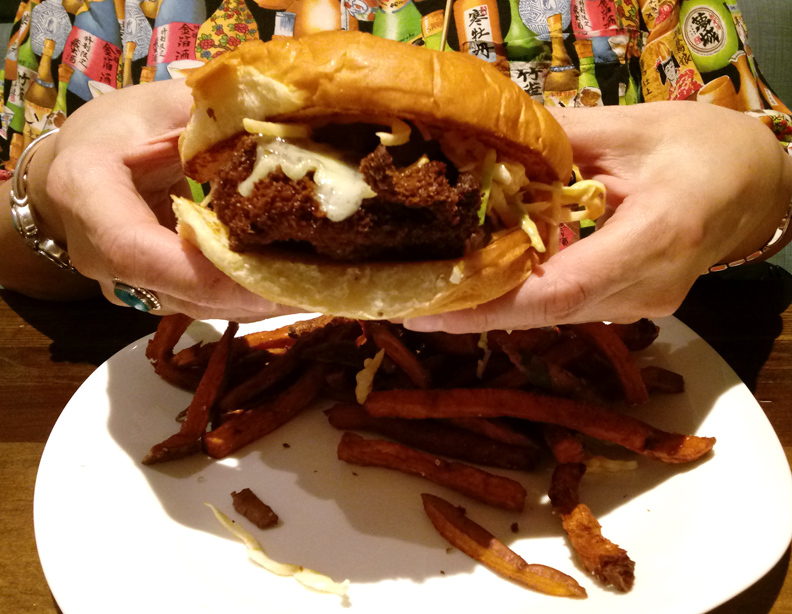 Sandwiched within a large King's Hawaiian sweet bread bun, the Chicken Katsu-wich features a crispy fried chicken breast topped with bacon lardons, baby swiss, and shredded cabbage. Firecracker aioli oozes from this spicy, unctuous sandwich that is at once exotic and familiar. The sweet potato fries were a great accompaniment, but you can get regular fries if you prefer. Uncle's Hawaiian Grindz has a varied list of tempting Hawaiian-inspired desserts, but after all the food we had already eaten, we didn't think we could indulge any more. Tommie Koukoulis insisted that we at least partake of one of their lighter desserts, the Whipped Otai. Fresh mango, pineapple, and shaved coconut are mixed into a whipped coconut cream, then topped with crushed macadamia nuts and fresh mint. Light and refreshing, and very fragrant, it's a perfect dessert for a hot summer evening (or any time really). Before we went to Uncle's Hawaiian Grindz, I wanted to find out what the word "grindz" meant. As I discovered, it simply means "good food." In that case, the restaurant certainly lives up to its name.